Production: Metro-Goldwyn-Mayer Pictures Corp.; Technicolor, 35mm; running time: 136 minutes; length: 12,256 feet. Released 1959. Filmed in New York City, Long Island, Chicago, and at the Mount Rushmore National Memorial, South Dakota. Producer: Alfred Hitchcock; screenplay: Ernest Lehman; titles: Saul Bass; photography: Robert Burks; editor: George Tomasini; sound recording supervisor: Franklin Milton; production designer: Robert Boyle; set decorations: Henry Grace and Frank McKelvey; art directors: William A. Horning and Merrill Pye; music: Bernard Herrmann; special effects: A. Arnold Gillespie and Lee LeBlanc. Cast: Cary Grant ( Roger Thornhill ); Eva Marie Saint ( Eve Kendall ); James Mason ( Phillip Vandamm ); Jessie Royce Landis ( Clara Thornhill ); Leo G. Carroll ( Professor ); Philip Ober ( Lester Townsend ); Josephine Hutchinson ( Handsome woman ); Martin Landau ( Leonard ); Adam Williams ( Valerian ); Edward Platt ( Victor Larrabee ); Robert Ellenstein ( Licht ); Les Tremayne ( Auctioneer ); Philip Coolidge ( Dr. Cross ); Edward Binns ( Captain Junkett ); Pat McVey, Ken Lynch ( Chicago policemen ); John Beradino ( Sgt. Emile Klinger ); Nora Marlowe ( Housekeeper, Anna ); Doreen Lang ( Maggie ); Alexander Lockwood ( Judge Anson B. Flynn ); Stanley Adams ( Lt. Harding ); Larry Dobkin ( Cartoonist ); Madge Kennedy ( Housewife ); Tommy Farrell ( Elevator starter ); Maudie Prickett ( Maid, Elsie ); Ned Glass ( Ticket agent ); Alfred Hitchcock ( Man who misses bus ); Harvey Stephens ( Stockbroker ); Walter Coy ( Reporter ); Harry Seymour ( Captain of waiters ); Frank Wilcox ( Weltner ); Robert Shayne ( Larry Wade ); Carleton Young ( Fanning Nelson ); Paul Genge ( Lt. Hagerman ); Robert B. Williams ( Patrolman Waggoner ); James McCallion ( Valet ); Baynes Barton ( Taxi driver ); Doris Singh ( Indian girl ); Sally Fraser ( Girl attendant ); Susan Whitney ( Girl attendant ); Maura McGiveney ( Girl attendant ). Lehman, Ernest, North by Northwest , New York, 1972. Manz, Hans-Peter, Alfred Hitchcock , Zurich, 1962. Wood, Robin, Hitchcock's Films , London, 1965. Truffaut, François, Le Cinéma selon Hitchcock , Paris, 1966; as Hitchcock , New York, 1985. Taylor, John Russell, Hitch , London and New York, 1978. Rothman, William, Hitchcock: The Murderous Gaze , Cambridge, Massachusetts, 1982. Wollen, Peter, Readings and Writings: Semiotic Counter-Strategies , London, 1982. Britton, Andrew, Cary Grant: Comedy and Male Desire , Newcastle-upon-Tyne, 1983. Schickel, Richard, Cary Grant: A Celebration , London, 1983. Wansell, Geoffrey, Cary Grant: Haunted Hero , London, 1983. Dupuis, Jean-Jacques, Cary Grant , Paris, 1984. Barbier, Philippe, and Jacques Moreau, Alfred Hitchcock , Paris, 1985. Bruce, Graham, Bernard Herrmann: Film Music and Narrative , Ann Arbor, Michigan, 1985. Wilson, George M., Narration in Light: Studies in Cinematic Point of View , Baltimore, 1986. Higham, Charles, and Ray Moseley, Cary Grant: The Lonely Heart , New York, 1989. Naremore, James, editor, North by Northwest: Alfred Hitchcock, Director , New Brunswick, New Jersey, 1993. Condon, Pauline, Complete Hitchcock , London, 1999. Bellour, Raymond, The Analysis of Film , Bloomington, 2000. McGilligan, Patrick, Alfred Hitchcock , New York, 2001. Hitchcock, Alfred, in Arts (Paris), January 1959. Houston, Penelope, in Sight and Sound (London), Summer-Autumn 1959. Interview with Hitchcock, in Films and Filming (London), July 1959. New York Times , 7 August 1959. Fitzpatrick, Ellen, in Films in Review (New York), August-September 1959. Baker, Peter, in Films and Filming (London), September 1959. Moullet, Luc, in Arts (Paris), October 1959. Douchet, Jean, "Le Troisième Clé d'Hitchcock," in Cahiers du Cinéma (Paris), December 1959. Richardson, A.W., in Screen Education Yearbook (London), 1963. Gow, Gordon, in Films and Filming (London), October 1974. "Hitchcock Issue" of Take One (Montreal), 21 May 1976. Magny, Joel, in Cinéma (Paris), October 1978. Lowry, Ed., in Cinema Texas Program Notes (Austin), 11 November 1978. Sator, M., in Cahiers du Cinéma (Paris), December 1978. Bergstrom, Janet, "Enunciation and Sexual Difference," in Camera Obscura (Berkeley), Summer 1979. Keane, Marian, "The Designs of Authorship," in Wide Angle (Athens, Ohio), vol. 4, no. 1, 1980. Boost, C., and W. Verstappen, in Skoop (Amsterdam), May-June 1980. Giacci, V., in Filmcritica (Florence), January 1981.
" North by Northwest de Bernard Herrmann," in Séquences (Montreal), April 1981. Marinero, N., in Casablanca (Madrid), May 1981. Roquena, J. G., "En el unbral de lo in verosimil," in Contracampo (Madrid), September 1981. Brill, L., " North by Northwest and Hitchcockian Romance," in Film Criticism (Edinboro, Pennsylvania), Spring 1982. Bourget, J. L., in Positif (Paris), May 1982. Bannon, B. M., "Double, Double, Toil and Trouble," in Literature/ Film Quarterly (Salisbury, Maryland), vol. 13, no. 1, 1985. Ven de Ven, L., "Alfred Hitchcock's Film Music," in Soundtrack (Los Angeles), January 1985. Dean, Peter, "Video: North by Northwest Directed by Alfred Hitchcock," in Sight & Sound (London), vol. 3, no. 11, November 1993. Burlingame, Jon, "Scoring Hitchcock," in Grand Street (New York), vol. 13, no. 1, Summer 1994. Petersen, George, "Building Character Through Violence: A One-Two Punch," in Creative Screenwriting (Washington, D.C.), vol. 3, no. 1, Summer 1996. Lehman, Ernest, "Back Story," in Fade In (Beverly Hills), vol. 2, no. 3, 1996. Care, Ross, "Record Rack," in Scarlet Street (Glen Rock), no. 21, Winter 1996. Worden, J., "Thirty-nine Steps to Immortality," in Armchair Detective, vol. 29, no. 4, 1996. Lehman, Ernest, and Joel Engel, " North by Northwest /Writing North by North-West," in Scenario , vol. 3, no. 1, Spring 1997. Morris, Christopher D., "The Direction of North by Northwest ," in Cinema Journal (Austin), vol. 36, no. 4, Summer 1997. Butte, G., "Theatricality and the Comedy of the Mutual Gaze in Hitchcock's Cary Grant Films," in Hitchcock Annual (Gambier), Fall 1997/98. Teachout, Terry, "The Genius of Pure Effect," in Civilization (Washington), vol. 5, no. 1, February 1998. Still wanting to write that definitive Hitchcock movie, Lehman hastily launched into a spec script he hoped would capture the director's interest. It was a thriller Lehman initially titled In a Northerly Direction , then Breathless , about an advertising man who is mistaken by spies for a government agent on their trail. Completing it in record time, he submitted the script to Hitchcock, who was delighted with it—and the script, finally retitled North by Northwest , went before the cameras almost immediately. North by Northwest is not the definitive Hitchcock movie, for while the master's metier is indeed the thriller, his thrillers are not all the same type. Vertigo , his previous film, is as different in style and tone from North by Northwest as Psycho , the film he made after North , is from both of them. What Lehman did achieve is the definitive Hitchcock chase movie, a delightful homage to and summation of such earlier Hitchcock films in the same vein as Saboteur, Foreign Correspondent , and the grandaddy of them all, The 39 Steps , the prototypical wrong man on the lam who finds romance chase thriller that brought Hitchcock international acclaim and, ultimately, his ticket to Hollywood. Saboteur and Foreign Correspondent remain noted for their memorable climactic set pieces—a fall from the Statue of Liberty in the former, a subjective eye view of a plane crash in the latter. The 39 Steps sparkled with charm and wit, as well as thrills, while lacking such spectacular set pieces. North by Northwest offers the best of all three. It is a film of spectacular set pieces linked by some of the brightest dialogue in the romantic comedy canon and performances to match. Two of the film's set pieces are among the most famous in movie history: Grant's pursuit through a cornfield by a plane dusting crops where there aren't any crops; and the hair-raising climax on Mount Rushmore where Grant and Eva Marie Saint are chased across the faces of Presidents Washington, Jefferson, Lincoln and Roosevelt by thugs Martin Landau and Adam Williams. The crop-dusting chase was shot on location, but the Mount Rushmore sequence was not. The U.S. Department of the Interior denied its cooperation and Hitchcock was forced to shoot the scene in the studio, employing oversized sets, backdrops and photographic plates of the actual monument to remarkable effect. Next to the shower murder in Psycho , it's probably the most acclaimed, and frequently studied, scene in a Hitchcock movie. 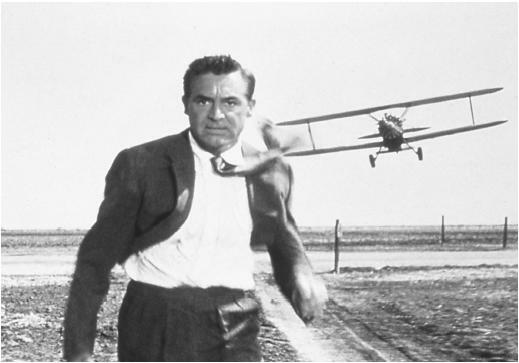 North by Northwest marked the fourth and final appearance by Cary Grant, one of Hitchcock's favorite leading men, in a Hitchcock movie—in a role that was written expressly for him and suits his persona of comic urbanity to a T. As complacent ad man turned long-distance runner for his life Roger O. Thornhill ("That's me. Rot. "), Grant charms the pants off the audience and co-star Saint, the not-soice-cool blonde who may or may not be on his side. James Mason makes a perfect match for Grant in the suavity department as the bad guy—and is axiomatic of Hitchcock's policy that the better the villain, the better the film. Composer Bernard Herrman's striking, and still influential, fandango score is also a high point—although, amazingly, there's only seventeen minutes of it in the entire 136-minute film!